These Joss Sticks consist of pure moxa rolls for mild moxibustion. Joss stick burning is an everyday practice in some religions. Different types of joss sticks are used for different purposes or on different festive days in many East Asian countries, traditionally burned for a religious image, idol or shrine in front of a door, or open window as an offering to heaven, or devas. 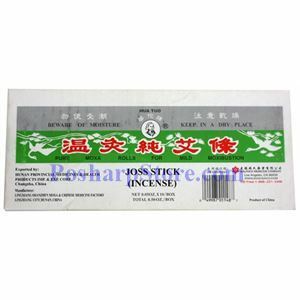 Today, joss sticks are used to enhance the smell of a room, or for moxibustion which is an oriental medicine therapy utilizing moxa, or mugwort herbs.